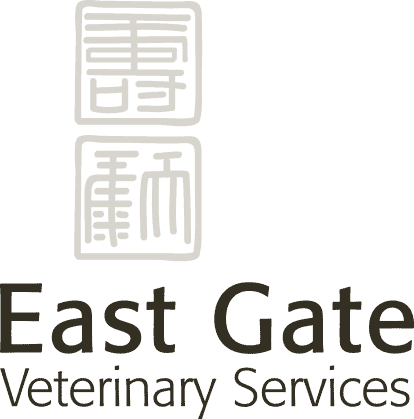 The low level laser used at East Gate Veterinary Services for biostimulation and laser-puncture is the latest generation, high quality laser device from Reimers-Janssen in Germany. It is manufactured by one of the foremost producers of laser-puncture and physio equipment in Europe - they have been creating and improving on laser therapy since 1982. 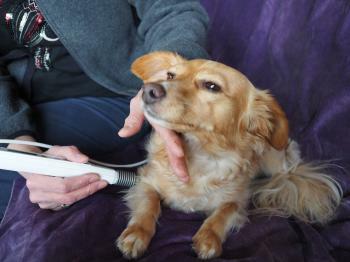 Their profound knowledge of complimentary methods has allowed them to create a product that advances the use of gentle laser therapy across a large range of applications. 'I am personally impressed with the results I am obtaining with this portable, computerized Class 3B laser. '...states Dr Harrison. Cells in the body communicate through the use of biophotons that are produced by the cell nucleus. The biophotons are in the ultra-violet and infra-red spectrum. The failure of cells to communicate amongst themselves through the use of biophotons can lead to pathological processes and vice-versa. Research has shown that biophoton activity can be stimulated by lasers. Much of the laser energy is reflected at the skin level but the 5% to 10% of the energy that does reach the cells at a deeper level affects the mitochondria of the cells, causing the production of cellular energy to increase. Damaged cells or those affected by illness have an elevated energy demand and the additional energy that the laser can provide may have a significant, positive effect on these cells. 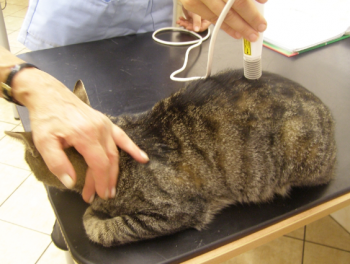 How will laser therapy help my pet? 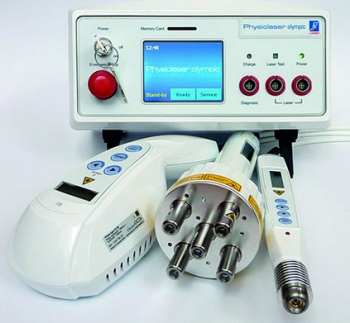 Can laser be an effective acupuncture replacement? Laser can be used to accomplish any acupuncture treatment that would normally be done with needles. Laser acupuncture has the additional benefit of not being traumatic to the patient and may even be accomplished without direct skin contact. Laser puncture is even preferred over needles for such treatments as ear acupuncture. Laser acupuncture is more than just a treatment of acupuncture points with a laser, but is a combination of two individually successful treatments into one highly effective therapy. These videos were produced by RJ Laser and are shown on the Lasers for UK Veterinary Care site - we invite you to visit this site for more indepth information on the advantages of laser therapy.